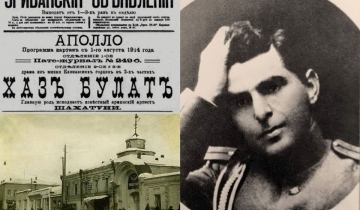 Arshavir (Asho) Shahkhatouni went down in history as both a star of Russian and French silent films in the 1910s and 1920s, and as the military commander of Yerevan during the first Republic of Armenia. One would say that it was a genetic trait: his father Vagharshak Shahkhatuni (1843-1892) was a colonel in the Russian army, and also the founder of the theater hall of Alexandropol (nowadays Gumri). Arshavir was born in Alexandropol on February 19, 1885. He spent his childhood in Alexandropol, Nor Bayazed (Gavar), Gandzak (Ganja), and Yerevan. He studied at the Mikhailov military school of Tiflis (Tbilisi) and served in Baku in 1905. After the Armeno-Tatar clashes of 1905, he was expelled from the army for refusing to fire over Armenians who had found refuge in a church, as it had been ordered to the battalion he commanded. He went to work in an office and started developing his love for theater as an amateur actor in the local Armenian groups. Over the next seven years (1905-1912), he would gradually become a sought-after name in Armenian theater, both in Baku and in Tiflis. The first Romeo on the Armenian stage, Shahkhatouni was considered, together with Hovhannes Abelian, the preeminent representative of realism in Armenian acting. In 1913 Shahkhatouni was offered an important role in “Bela,” a movie by Alexander Gromov. For the next five years, he would live in Moscow, where he studied at the Artistic Theater and followed the classes of famous theater theoretician Konstantin Stanislavski. Meanwhile, he continued his cinematographic career, starring mostly in films with Caucasian themes, such as Alexander Volkov’s “The Conquest of the Caucasus,” “The Fugitive,” “Khaz bulad,” as well as others like “Jealousy,” “Storm,” “Venus’ Fur,” etcetera. He was highlighted as one of the well-regarded names of pre-Soviet cinema, becoming also one of the first Armenian actors to appear in Russian cinematography, along with Hamo Bek-Nazarian and Vahram Papazian. In the crucial year 1918, Shahkhatouni left Moscow and returned to the Caucasus. His former military experience would lead him to participate in the battles of Sardarabad and Pash-Abaran, and after the foundation of the Republic of Armenia, he was designated military commander of Yerevan, receiving the rank of colonel. After two years of service, in 1920 Shahkhatouni left Armenia and returned to his old love, theater, this time in Constantinople. He became one of the prominent names in local Armenian theater, until he left the city in late 1922, following the nearing occupation by Kemalist forces. He went to Bulgaria, where he played Hamlet and Othello in Russian with Bulgarian companies in Sofia and Varna. After a year, in 1924 he moved to Paris with America in his sight, but he eventually stayed in the City of Lights, where he became one of the stars of local Armenian theater during the 1920s and 1930s. Meanwhile, Shahkhatouni developed the second phase of his cinematographic career. In 1926 he was cast in “Michael Strogoff,” a movie by Russian emigré filmmaker Vsevolod Turzhansky, who knew Shahkhatouni from Moscow. A more important achievement was his participation in Abel Gance’s monumental film, “Napoleon” (1927), where he played the role of Napoleon’s childhood friend and later mortal enemy Pozzo di Borgo. He would become friends with such famous names as French filmmaker René Clair and British actor Sir Laurence Olivier. He also participated in five films from 1927-1929. Armenian national hero Antranig passed away in Fresno in August 1928. In the same year, Shahkhatouni directed and played in “Antranig,” the first Armenian feature movie filmed in the Diaspora with Armenian subject and by an Armenian studio (“Armena-Film”). The film was distributed in several European countries, from Portugal to Sweden, with Turkey protesting against its exhibition. For this reason, it was never shown in the United States, except for one showing in Philadelphia in 1938, in a sound version. After sound movies made their appearance, Shahkhatouni’s movie career took a radical turn. Although he participated in a few films at the beginning, he could not continue acting, due to his insufficient knowledge of French. He continued appearing in Russian and Armenian theatrical performances, and wrote two plays, which were performed in the 1940s. However, he did not want to sever his relations with cinematography. He became a make-up expert, and he was credited in many movies of the 1930s, to the point that he was named “a leading professional cosmetician in the world” by the French Journal de la femme (1939). By 1953, forty out of sixty make-up experts working in French cinema had been Shahkhatouni’s students. Shahkhatouni, who always lived with nostalgia for his faraway homeland (he would have probably shared the fate of so many people who were victims of the Stalin purges for their participation in the first Republic of Armenia), suffered a fatal blow after the death of his wife Nina in 1950. He had a stroke, and for the next seven years he lived in poverty, practically confined to his home. The fiftieth anniversary of his theatrical career was commemorated in New York, in 1956. He passed away on April 4, 1957. Prepared by the Armenian National Education Committee (ANEC), a joint project of the Eastern Prelacy of the Armenian Apostolic Church and the Armenian Relief Society. 2013 Armenian National Education Council (ANEC). Picture Window theme. Powered by Blogger.